The Star Falcon and the Star Phoenix present the backbone of Star Force's aerospace superiority, or lacking of it. They were fast, they were strong, and were equipped with enough to inflict plenty of damage in any condition: Dogfighting, ground attack, interception, etc.. They were essentially multi-role fighter bombers. With the rise of purpose-built fighters, however, the Falcon and the Phoenix were soon seen to be lacking compared to the aforementioned fighters, when put against them in simulated, purpose-specific missions. So the time has come to downsize them. We've already seen the latest Star Falcon incarnation, the Star Falcon L. Now it's the Phoenix's turn. An LXF file can be downloaded here. The V is the latest incarnation of the Star Phoenix series of Star Fighters, produced by United Star Fighters Incorporated. Armed with two wingtip medium phaser guns, two light phaser guns on the nose, a small complement of micro photon torpedoes, and two holding racks in the back for equipping either two rockets or bombs, the Phoenix is definitely well armed for handling any situation. Defenses consist of armor plating and standard Star Force shrinkwrap deflector shielding. 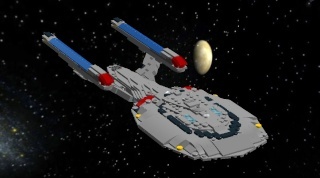 The V is warp-capable, with a maximum speed of Warp 7.45. Compared to the Star Phoenix IV, the V is downsized in most areas. Exceptions include larger wings and slightly stronger engines. Otherwise the V is shorter, smaller, and carries less weaponry - the V is a more technologically advanced fighter, though. Compared to the Star Falcon L, the Star Phoenix V has a longer range and has more room for being a multi-role fighter. The Falcon on the other hand is slightly faster, is more agile in an atmospheric environment, and has stronger armor. Both fighters are capable of doing battle against each other, though - in the end it is the pilot and his skill that will prevail. NIIIIIICE fighter! But that last paragraph kind of sells it short. It sounds like (save for range) the Falcon is a superior fighter in every way... which is a shame, because this may be your best looking fighter... ever... period. WELL done! I LOVE your newest style. Best looking? No no no.... well, maybe. The Falcon is indeed a bit superior but only as a fighter. The latest Phoenix is capable of taking on more roles than the latest Falcon, which is really a good thing. It's actually a bit strange. I'd imagine the latest Phoenix being a more successful fighter, or at least a faster fighter than the latest Falcon. Let's blame the engines on that. The Phoenix V is using the same engines as the IV, tuned a bit to be slightly stronger but that's it. If they got a full overhaul like the Falcon L's engines, the lighter Phoenix should be able to pull ahead in a straight line. Ah, well, I still think it's purdy. And I'm glad you like it.